The Cassini spacecraft team has digitally remastered this new image of Saturn's moon Prometheus, showing more clearly its oblong shape, as well as numerous craters over its 100-kilometer length. 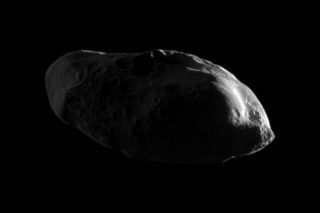 Recent pictures of a tiny oblong moon of Saturn — calledPrometheus — have revealed new details about the intriguing rocky satellite. The pictures, taken by NASA's Cassini spacecraft, show Prometheusas a potato-shaped Saturn moon about 62 miles (100 km) long. Its surface is pockmarkedall over with impact craters from smaller space rocks that have smashed intoit. Cassini has been orbiting Saturn since 2004 and made a closeflyby of Prometheus in January to record the new snapshots. Digitallyremastered photos from the encounter were released last month. Cassini, a joint project of NASA, the European Space Agencyand the Italian Space Agency, launched in 1997. The prolific probe recently receiveda mission extension that should keep it going through 2017.